These heavy-duty black trash bags are workhorses in the warehouse, kitchen, or backyard. With a large 55 to 60 gallon capacity, they can take on big loads of up to 90 lbs. The strong and stretchy low-density plastic material is 1.5 mil thick to provide plenty of puncture resistance, and you can stuff these bags to the top and never worry about tearing or springing leaks. Each bag boasts a star seal, which means the plastic has been carefully folded and reinforced so that it can expand to fit large or awkward contents without splitting. Packed on rolls for easy dispensing. These bags have been proudly crafted in the USA to the very highest standards. These heavy-duty black trash bags are workhorses in the warehouse, kitchen, or backyard. With a large 55 to 60 gallon capacity, they can take on big loads of up to 90 lbs. The strong and stretchy low-density plastic material is 1.5 mil thick to provide plenty of puncture resistance, and you can stuff these bags to the top and never worry about tearing or springing leaks. Each bag boasts a star seal, which means the plastic has been carefully folded and reinforced so that it can expand to fit large or awkward contents without splitting. Packed on rolls for easy dispensing. These bags have been proudly crafted in the USA to the very highest standards. These bags worked great for a garbage can that was very hard to find a bag that would fit. Seemed like if they were long enough they were too narrow to fit around the top. I could hardly believe it when it fit so well. We have a large garbage can in our kitchen, and conventional garbage liners were not sufficient. I found the Plastic Place had just what I needed! 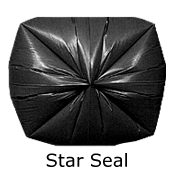 love our 55-60 gallon trash bags/shipped speedily/free postage. thanks very much. the bags work well for our trash can. we especially like the roll/easier to get out of box.